After arriving in Reykjavik bright and early, and dropping my bags off at Reykjavik Downtown Hostel, I set out to find a cafe where I could ride out a morning blizzard. Stofan Cafe was the perfect spot to relax with a warm cup of chai and a pastry (about $12 US). Since I wanted to keep myself awake, I chose to sit at a table, but there are plenty of soft vintage couches and chairs if you want to be a little more comfortable. Besides drinks and sweets, Stofan also has a variety of sandwiches and soups. I spent an evening hanging out and working at Kaffibrennslan, another warm and inviting cafe with a very friendly staff. I enjoyed the salmon sandwich special – there’s typically about a dozen sandwiches on the menu – and nursed a cup of tea (about $20 US). The desserts looked tasty as well – particularly the carrot cake – but to save some cash, I opted to stop at the grocery store on the way back to the hostel and pick up a chocolate bar. 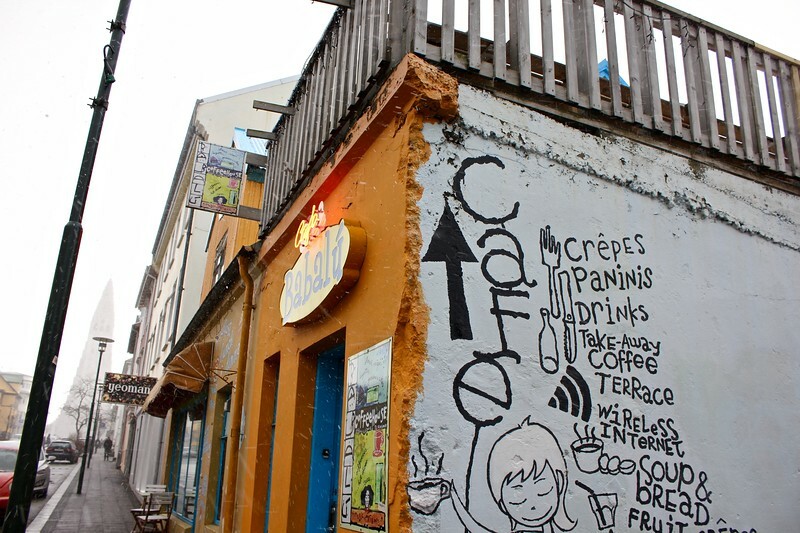 I was drawn to Cafe Babalu – which sits right on Skólavörðustígur, the main road through the tourist area – because its yellow exterior stood out on a cloudy day. The inside is quite colorful as well and features mis-matched tables and chairs along with quirky decorations. It has many vegetarian and vegan options available including salads, soups and sandwiches – I chose the caprese panini (about $15 US). I would’ve spent more time there, but unfortunately, I was seated next to an obnoxious young man who held a loud phone conversation next to me detailing his female conquests around the globe. Reykjavik Fish was recommended by a foodie friend of mine, and it didn’t disappoint. After a long day of walking around and taking a dip in one of the local pools, I was in the mood for some comfort food. I didn’t get down to the Old Harbour until about 9:30 p.m., when most restaurants were closing up, but fortunately Reykjavik Fish was happy to serve me. 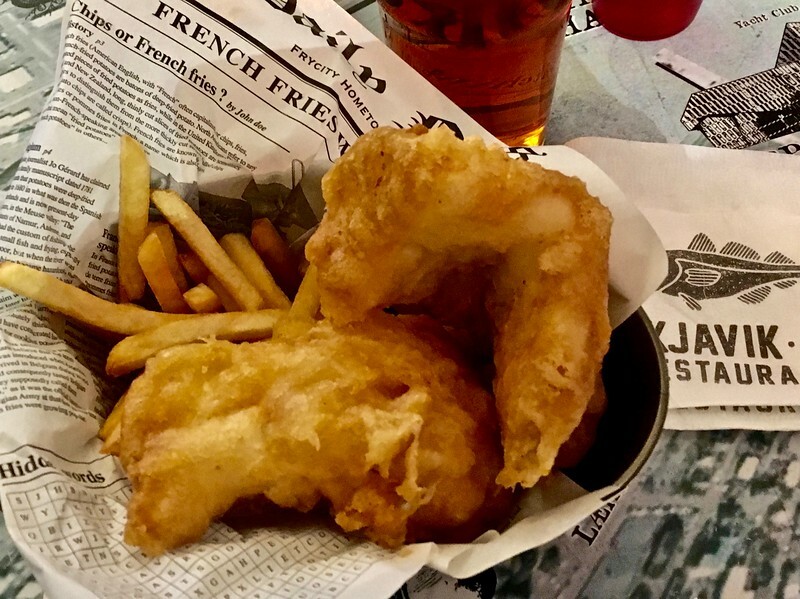 I devoured a heaping plate of fish and chips and washed it all down with a Viking beer (about $25 US). Tip: Friends who have spent more time in Iceland than me me recommend buying packaged foods at grocery stores and gas stations. (Apparently the gas stations have surprisingly good food!). I noticed grocery store sandwiches cost about $10 US, whereas in cafes they were about $15. Reykjavik loves its coffee. (I have a feeling it’s like Seattle – people need caffeine to compensate for the lack of sunshine.) Reykjavik Roasters was recommended by the same friend who recommended Reykjavik Fish. 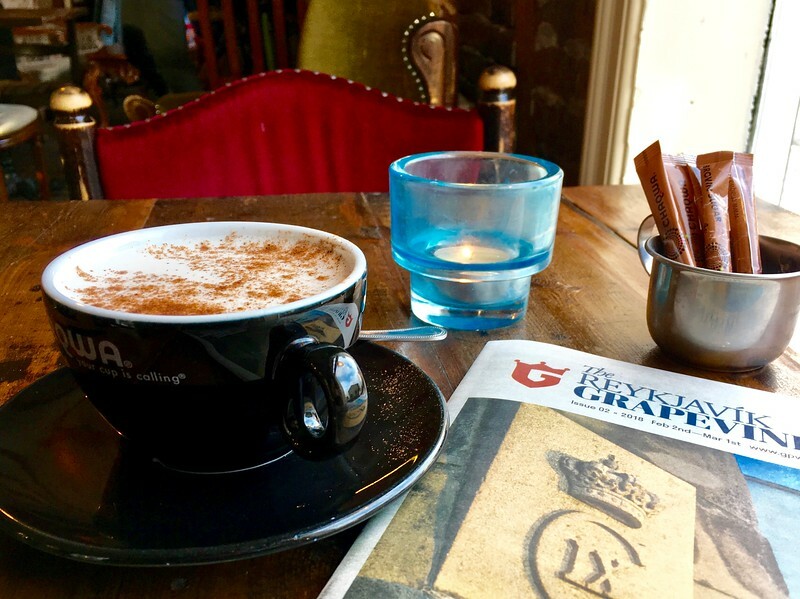 There are two locations – I made a stop at Kárastigur, the original location, late afternoon on my second day to refuel with a cafe latte. The interior is light and modern, but since there aren’t many seats, I was stuck next to a man who pestered me with marriage proposals (He was looking for a way to get to the U.S. I politely declined.) 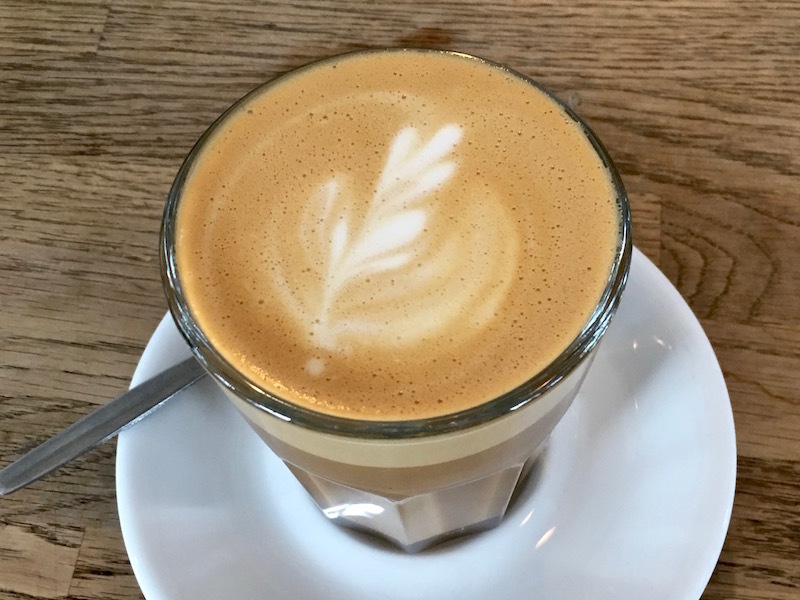 But I was able to get a bit a work done, and I enjoyed my latte, which was creamy and strong. 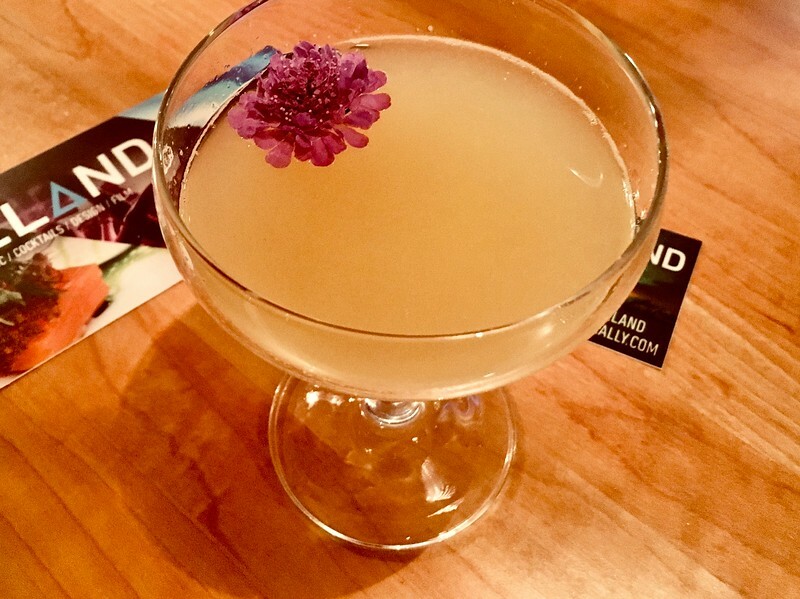 I’m usually skeptical of hanging out underground – college bar flashbacks – but I made an exception for Micro, which is consistently listed as one of the best bars in Reykjavik. It’s one large, no-frills room with a bar that runs along one wall and lots of colorful wooden tables and chairs. There was no music playing while I was there – I’m not sure if it’s always like that – but both the tourists and locals around me seemed to be having a good time. I read my book and chatted with the bartender, who recommended five of the dozen or so Icelandic beers on tap for my flight (about $30 US). 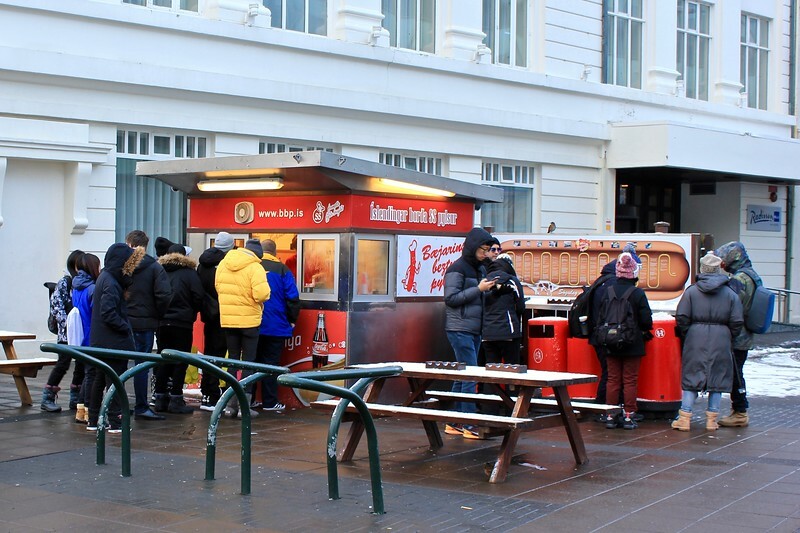 Skúli, which also makes a lot of “best bar in Reykjavik” lists, is a more traditional-style pub that sits in the corner of a building right off Austurvöllur square. Like Micro Bar, it has a nice variety of Icelandic beers on tap as well as a very friendly bartender (this one was half Icelandic, half American). I foolishly ordered an American beer (about $13 US) because I didn’t recognize the name. But I had a nice time chatting with the American couple from D.C. that sat next to me at the bar. Pablo Discobar is a bonus recommendation because I actually didn’t get to visit this quirky 70s-themed bar during my 48 hours in Reykjavik. However, I did get to meet bar manager Teitur Ridderman Schiöth, one of Iceland’s hottest bartenders, at Taste of Iceland in Boston last month. I can assure you, he makes a tasty cocktail. Tip: Alcohol in Iceland isn’t cheap. I’ve heard that it’s a good idea to bring alcohol with you in your suitcase or pick some up at Duty Free at the airport. Also, many bars have good happy hour specials, so try to schedule your drinking for that window of time. 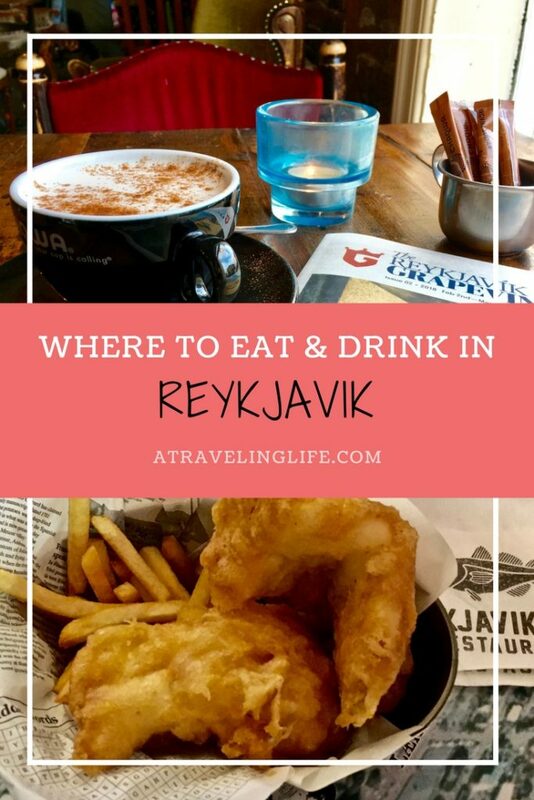 What do you think are the best places to eat and drink in Reykjavik?